Assistance dog training centers across the United States have discovered a new source of volunteers ready and willing to commit at least a year of their time to raising a service dog puppy and preparing him or her for formal task training. These people are inmates incarcerated in correctional institutions around the country. My new friend Fergie, a career changed dog from Leader Dogs for the Blind, was raised in that organization’s prison puppy program, and her raiser did a wonderful job with her. Naturally, I wanted to learn more about this initiative, so I did some research and thought I’d share my findings. The first thing I wanted to know about was the screening process for inmates interested in participating in the puppy program. I discovered that this is pretty extensive. Anyone interested needs to submit an application and participate in an interview with staff at their correctional facility. Also, only inmates who have demonstrated good behavior while incarcerated will be permitted to raise a puppy. Puppy raising in the prison program is quite similar to raising a puppy on the outside. Seven-week-old puppies are given to an inmate, or sometimes a team of two or three inmates, to raise for twelve to fifteen months. The inmates teach their charges the exact same things that any future leader dog would learn. Puppies get socialized to all kinds of people, vehicles, and other dogs. They also learn about strange sounds and unusual surfaces, again just like any guide dog puppy. Fergie is a total pro with all of this stuff. She also is really well-behaved in the house, which is very important for her partner, who has Parkinson’s Disease and needs a calmer type of dog. Fergie’s raiser taught her never to get on furniture, never to beg for food, and always always to chew on her own toys instead of socks or pillows. She also knows how to relieve herself on leash when asked and greet new people calmly. She’s a great dog, and her raiser, an inmate, deserves a lot of credit for giving her the foundation she needed. Once or twice a month, inmates are required to attend training sessions with their puppies hosted by volunteer puppy counselors. The puppy counselors use these sessions to teach skills needed for raising the best possible Future Leader Dog. They can also evaluate puppies during these meetings in order to make sure things are going smoothly. Of course, not every single thing can be covered during two training sessions per month, so inmates are given puppy raising manuals and other material to review on their own. The Prison Puppies and Leader Dogs! 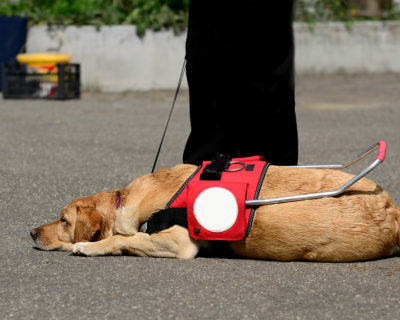 Prison puppies are supported financially 100% by Leader Dogs for the Blind. That is, the organization provides food, toys, equipment, and veterinary assistance for all puppies in this initiative. However, inmates are required to socialize, train, play with, and care for their puppies twenty-four hours a day as with any other puppy raiser. As we all know, raising any puppy is a full-time job, but inmates truly do volunteer their time. Many of them are still required to have a separate job within the prison system, and yes, often their puppy gets to come to work with them. Many of the most successful Leader Dogs have come out of the prison puppy initiative. Prisons are by necessity very structured environments, and many puppies actually thrive on this. Formal harness training is also, well, a very structured environment, so often prison puppies adapt quite well to living in the kennels and bond easily with their trainers. The program also has a profound impact on prisoners’ rehabilitation. According to the wardens, the puppies help boost morale among both inmates and prison staff. Their presence alone helps reduce stress and foster better social interactions between prisoners and correctional officers. Raising guide dog puppies helps teach inmates patience, compassion, and responsibility. According to Leader Dogs for the Blind, inmates are happy to have an opportunity to give back to society by helping someone in need. The prison puppy program currently operates in facilities in three states. Leader Dog’s prison puppy initiative is a great way for the organization to have excellent young dogs ready to begin their formal training, inmates to develop skills that will help them throughout their lives, and for clients to receive excellent canine partners. For more info on this initiative, please take some time to watch this excellent video provided by Leader Dogs for the Blind. You’ll be glad you did!